Whether you work at home or in an office, we all work. Sometimes we have to fit our work in between this and that, but sometimes we can carve out a bit of time. What do you do when you’ve got 2 hours to get stuff done. If you’re like many people, you spin your wheels for a good amount of time before you actually get anything done. It isn’t that you don’t have a ton to do and neeeeeed to do it, sometimes it is just hard when there are several things swirling in your head that ALL seem important and you just don’t know where to start. This happens to all of us! Here is my trick to getting out of your head and getting stuff done. Create space at your desk and sit down. Write down everything you need to do, during work hours and after work hours. No task you think of is too little or too big. Just get it all out of your head! Go through the list and check things that need to happen today sometime. Star the three things that are most important to get done during your current work time. Number each starred item 1, 2, or 3 based on the most sensible and efficient order. Many times I’ll choose to get the quicker tasks done first. WORK! If any new tasks come up while you work, write them down on your master list. Once you complete the tasks, go back and pick another 3 tasks if you have time. Repeat. Additional tip — If any of the tasks seem large and overwhelming, get a fresh sheet of paper out. At the top of the paper, put the name of the big task. Brainstorm and fill in a list below of all the small tasks it will take to complete the bigger project. Voila! Use this list to choose a few tasks at a time to get done. 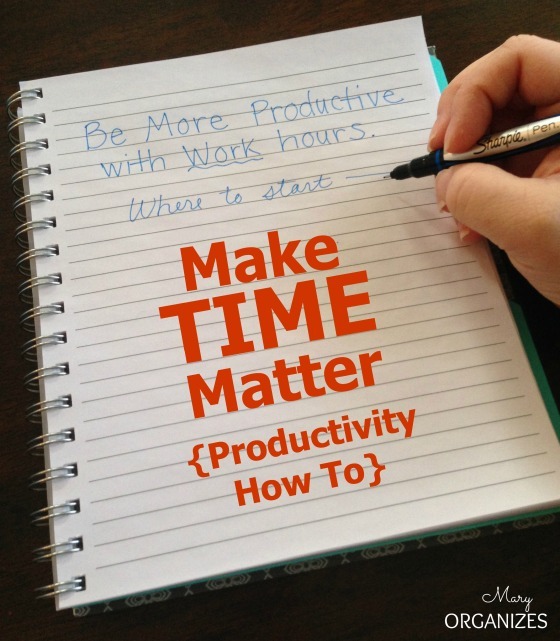 If you follow these steps, you can stop spinning your wheels and make your time matter! Get things done!! That should be enough to give you a good start. Organizing our time is the only way we can seem to create more of it! I have been using this method for YEARS, and STILL look to people like you to help me organize !!!! Even though apparently I “am” organized, since I have always used the methods great organizers like you use, I still feel like a fraud, and don’t seem to be able to accomplish what I think I should.. Have you ever felt this way? Hmmm. I’m not sure. What makes you feel unorganized? So funny Mary… I actually did something very similar to this last night. I hadn’t done it before, and I hadn’t read this post yet. It seemed to work pretty well, and now you’ve confirmed that I’m on the right track, so yea! I think what you mean by unchangeable is difficult to change, especially as he has to be the one to want to change. We all can change and grow. None of us are really stuck, it just can feel like that sometimes.